Alexandra Oliver-Davila (left) and J. Keith Motley. 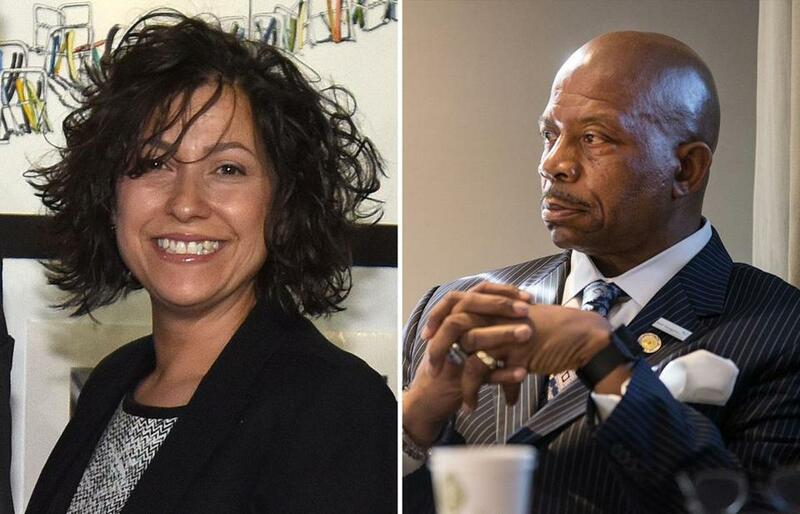 Boston School Committee member Alexandra Oliver-Davila and former University of Massachusetts chancellor J. Keith Motley will cochair a panel charged with finding a new superintendent for the district. Other members of the panel will be announced in the coming weeks, and their first order of business will be to hire a search firm and to consult with the public as they write a job description. The goal for the panel is to recommend finalists for the post in early 2019. The task begins as interim superintendent Laura Perille has repeatedly declined to say whether she will apply for the job. Many education advocates and civic leaders have said they are concerned her silence could have a chilling effect on the panel’s ability to attract the best candidates, who might be reluctant to go through a public search if an inside candidate is a perceived favorite. Oliver-Davila expressed skepticism last week about a Perille candidacy. Perille never worked previously as a superintendent, principal, or teacher, and doesn’t hold a state license to run a school system. Oliver-Davila said she doubted that a person of color who lacked such credentials would ever have been appointed to interim superintendent. A fellow School Committee member, Miren Uriarte, said this summer that she had recommended experienced educators of color for the interim post, but that she was told any appointment could give them an unfair advantage if they later pursued the job permanently. Motley’s appointment as cochair, meanwhile, is raising some eyebrows because he has a past working relationship with Perille while she was head of the Boston nonprofit EdVestors. He has served in recent years on that organization’s selection panel for the School on the Move Prize and last year hosted an EdVestor event at a Seaport hotel where the winner was announced. Peggy Wiesenberg, an education advocate who has been pushing the Boston public schools system for years to be more transparent, said Motley’s appointment could send yet another signal that Perille might have an edge if she applies for the job. Wiesenberg also raised concerns about the School Committee soliciting funds from philanthropic organizations to pay for the search, given Perille’s ties to that sector. School Committee chairman Michael Loconto said he did not believe Motley’s involvement with EdVestors would present any conflict of interest in the search. James Vaznis can be reached at james.vaznis@globe.com.